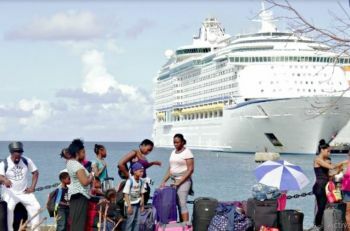 Mr Mapp announced that the 866 people on St Croix were accommodated as part of the government’s “mercy mission” voyages. The ship left the Frederiksted dock at 5:00 PM and headed to St Thomas, where it will accommodate more persons before making a two-day trip to Fort Lauderdale, Florida. Once there, mercy mission passengers are to make their own way. In a press conference on Monday, October 2, 2017 to be held in St Thomas, Attorney General Claude Walker, along with the Medical Examiner’s Office, will reveal for the first time the identity of those who died as a result of Hurricanes Irma and Maria. Mr Mapp said the death toll, once said to be 7, had been reduced to 5, following autopsy results. While the governor expressed sympathy to the families of those who died, he lauded residents’ heeding of warnings to either prepare themselves or evacuate their homes, stating that the small number of deaths and trauma served as a testament to their preparation. “I cannot say that it’s five [deaths] in two hurricanes without saying that that’s still — for the kind of winds that went through the V.I. and the kinds of destruction that we suffered, to lose five souls and to not have a lot of trauma — is amazing,” Mr Mapp said. Private Naughton’s death has been deemed a homicide, and the V.I.P.D. along with its federal partners are investigating the incident. The governor, along with William Vogel, federal coordinating officer of FEMA Region II and V.I.P.D. Commissioner Delroy Richards, expressed condolences to Private Naughton’s family. I bet the people at the airport wasn't smart enough to collect data on the number of people who evacuated the BVI. Stop sounding like a fool. Or maybe you are just too daft and ignorant. It is called a MANIFEST. Go look it up. It is left with all authorities upon leaving a port. I'm so tired educating fools.